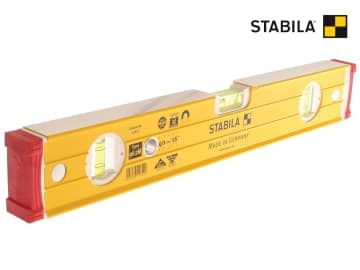 Stabila 96-M-2 Double Plumb Magnetic Levels made with a light metal rectangular profile with removable end caps, 2 vertical and 1 horizontal vial. With rare earth magnet system. In normal position: 0.029° = 0.5 mm/m. Overhead measurement 0.043deg = 0.75mm/m. Extra strong, light metal rectangular profile with ridges for gripping and removable bi-material end caps. These end caps provide increased damping and, when removed, a cleaner marking line right into the corner. 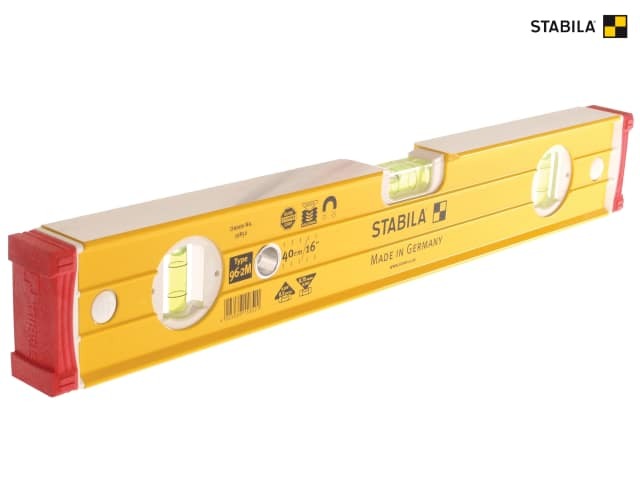 Note: Levels 150cm (60inches) and over have painted yellow faces to conform with the level of accuracy required in the Stabila range. Stabila 96-M-2 Magnetic Level 3 Vial.